A web journal run by the Goethe-Institut in Cairo was taken down late February. Before taking all the posts offline at least two articles related to Egypt’s military were censored for “security reasons” and all posts related to Egypt had been withheld from publishing. Funded by Germany's Foreign Office, Goethe is a non-profit German cultural association that operates around the world to promote the study of the German language abroad and cultural exchange. 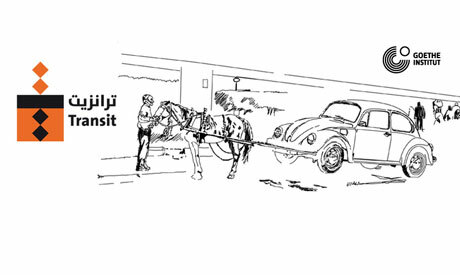 The web journal, Transit, was established a year ago with the theme “The Changing Arab World” and is published in three languages, English, German and Arabic, with contributing authors from 10 different countries. Daniel Roters, a contributor to Transit, wrote an open letter to the editorial staff asking why the web journal’s posts were taken offline without the team being notified. Christoph Sanders, another contributor, also wrote a letter asking for an explanation and addressed it to Dr Günther Hasenkamp, Goethe’s Middle East and North Africa cultural programme director. Numerous other contributors have written letters to Hasenkamp and director Gabriele Becker, who were responsible for the decision. “Even if you take it offline, you should tell everybody who had contributed and give them the reasons. It is a very authoritarian way of censorship,” says Julia Tieke, a contributor to Transit, whose piece about a military officer was also not allowed to run. In late January all contributions from or about Egypt were suspended from Transit. Becker denied that any articles were censored for reasons other than their quality, but emails obtained by Ahram Online show that Goethe refused the publication of at least two articles for security reasons. The first article by Magdy Samaan entitled 'Who are the True 'Fulul 'of Post-Revolution Egypt?' argues that the military are the true remnants or fulul of the Mubarak regime. Another article by Julia Tieke, written in January, was not published. The article, 'Trust me, I'm an Officer' describes an encounter Tieke had with a military officer, who expressed his love for Germans on account of Hitler. Becker admits that Goethe is concerned after German NGO Konrad-Adenauer-Stiftung (KAS) was raided as part of the Egyptian regime’s crackdown on NGOs. “We know that we are also watched,” Becker told Ahram Online. Becker said that she knew because the German Embassy was “signalled” and that it was communicated to her earlier in January. Becker is concerned not to further aggravate the regime. “We will continue to do our work but not provoke,” she said. The issue is not specific to Transit web journal; there were also incidents relating to KAS, Tahrir Lounge and the German University in Cairo (GUC) which suggest that there may be more widespread pressure on German institutions in Egypt. Early in January, Tweet Nadwa, a debate forum founded and organised by Egyptian blogger and activist Alaa Abdel-Fattah, was set to take place in Tahrir Lounge on 4 January but was cancelled at the last minute. Tahrir Lounge is a space that uses the Goethe premises but is administratively independent. Two informed sources, speaking on condition of anonymity independently confirmed to Ahram Online that the German ambassador applied pressure on Tahrir Lounge to cancel Tweet Nadwa. KAS may have been targeted in the NGO raids because of their work in relation to security forces. It brought Herbert Ziehm to Egypt to advise activists and other civil society actors about dismantling Egyptian State Security. Ziehm, who works for the federal commission that oversees old documents belonging to Stasi, East Germany’s now-dismantled secret police, travelled to Cairo twice: once after the storming of Egyptian State Security buildings in March 2011 and then in June. Meanwhile, two students at the GUC were expelled, three banned from classes, and an assistant professor's constract terminated for their political activities. The confrontation with university management came after a demonstration to commemorate GUC student Karim Kouzam who was killed at the 1 February Port Said football tragedy, in which more than 70 people were killed. Thousands of German University in Cairo (GUC) students demonstrated Wednesday against a decision to permanently expel the two students and ban three others from classes for their political activities. Hundreds of students – including a number from the Modern Sciences and Arts (MSA) University, the British University in Egypt (BUE), the American University in Cairo (AUC) and the Saint Fatima School – are currently staging a sit-in at the GUC campus to register their opposition to the move. Oliver Schlumberger, Middle East and Comparative Politics Professor at the University of Tübingen, suggested that these visits may have been enough to upset State Security and with the help of Mubarak-era international cooperation minister Fayza Abul-Naga they may have tried to enact revenge. If this is indeed the case, that this revenge may have extended to other German civil society institutions. The other explanation for the removal of articles is that the ruling Supreme Council of the Armed Forces (SCAF) is using its power to crackdown on civil society. The arciles removed for security reasons both spoke about military officers. “We don’t necessarily need to see huge dollar values moving back and forth between German companies and businesses controlled by the Egyptian military in order to believe that the interests of these German companies can dictate Berlin’s foreign policy,” says Shana Marshall, a PhD Candidate in International Relations and Comparative Politics at the University of Maryland. Marshall’s focus is the political economy of the Middle East and she has written recently about Egypt's military-industrial complex. In 2010, bilateral trade between Egypt and Germany reached 3.9 billion euros making Germany Egypt’s third largest trading partner. There is also expansive collaboration between the two countries in the field of water management and renewable energy. Germany and Egypt have a history of trade and dealings, some of which have sparked controversy such as the bribes received by General Abdel Hamid Wasfi, former director of a firm affiliated to the Arab Industrialisation Organisation (AIO) two years ago. In 2008, the contract to supply license plates to Egypt was controversially awarded to the German company Utsch without competitive bidding. Many of Egypt's largest projects are handled by German companies. "The German Company Fraport AG operates Egypt’s largest airport (Cairo Airport), which is also the hub for EgyptAir, where executive and upper-level management positions have been increasingly reserved for retiring military officials as a sort of unofficial pension programme, ” explains Marshall. Ferrometalco, a German-owned subsidiary, has been awarded the order for complete erection works of the steel making plant of Abu Zaabal Steel Mill. SAFE ID Solutions was selected by the Egyptian government to supply the machine readable passport solution adopted by Egypt in 2007. Technology from German company Siemens is used to produce smart cards for a joint venture between the Egyptian military and Kuwait’s Kharafi Group called Maxalto. The question remains whether these economic interests are important enough for German institutions to violate democratic principles. A protest against taking Transit web journal offline is planned outside Goethe on Wednesday under the name #OccuptyGICairo. Ebitihal Shedid, Transit’s editor-in-chief, has submitted her resignation. According to Becker, Transit will be up again by April.